I am not one of those people that knows what a “gigaflop” is... although it sounds as if it is something I should take an herbal regimen to prevent. I could not, on a dare or otherwise, rattle off the IP address of my built-in Ethernet card. I really do not have any idea how much memory I have or when I should think about getting more. I am one of those people that checks their E-mail and does their homework and organizes their music and uses the Internet to do just about everything from buy books to sign up for classes to view my bank records, and I have no idea how it all works. I don’t think I should have to for it to work flawlessly. That’s why I own a Mac. And a cool one, at that. My parents, for Christmas, replaced the computer I’ve had since ninth grade. Catherine the Grape, as I lovingly named her, is a purple iMac DV, 400 MHz, with a 10GB hard drive and a G3 processor. Her successor, Luxo, is my new 20-inch flat panel iMac sporting a 1.25 GHz G4 processor; a Seagate Technologies drive (with a claimed capacity of 80GB, but formatted, it’s only 74.53GB); a Pioneer DVD-RW DVR-106D optical drive (which can create both CDs and DVDs); and a billion bytes of memory. No, I don’t actually know any of this; I asked my Daddi. The computer itself looks like a little igloo with the screen acting as an oversized radar sticking out of the top. The color, according to Apple, is “snow,” so that only reinforces the mental image. Everything seems to run faster, and I certainly can work on more things at a time. For one thing, there is more space on the screen for me to spread my work out. For another, I can run nearly all of my application simultaneously with absolutely no problem. This makes my life incalculably easier, as I can have four windows open in Safari, a handful of windows open in iChat, be typing a missive to my parents in Apple Mail, and have SETI running in the background, minding its own business. Switching back and forth is effortless for Luxo and seamless for me. Anyone could appreciate this speed… applications nearly fly. The screen, as I am sure you will understand, is a gem that has not yet ceased to generate ooohs and aaahs from admirers. Everything is brilliant, sharp, and incredibly vivid. As shown in Apple’s commercials, the screen glides up and down and from side to side on the arm, seemingly floating in mid-air for great effect. The grand size of the screen, surprisingly enough, did not shock me at first as one would expect, but instead was most noticeable when I went back to Catherine to transfer some files and thought, “Wow… this is really small!” Luxo’s speakers are cute little ‘eyes’ that stare out at you while providing a great, rich sound (which is very important to me. I told my parents that if my old iSub didn’t work with the new iMac, I didn’t want it). Perhaps the most interesting feature of this computer is the ease with which one can install more memory. To do this, you have to remove the bottom panel of the base by undoing a number of screws. With the new iMac, these tiny screws don’t fall out of the access panel when removed from the computer base itself, so there is no need to crawl around on the floor in a harried quest to locate minute pieces of metal in order to reassemble the computer. As an added bonus, I have the U.F.O. (USB FireWire Organizer) base. It provides 4 USB and 2 FireWire ports, and space for storing unused lengths of cable. Highly convenient, it is also streamlined, with sliding doors to cover unused ports and a patented Cool-Blue Glow that keeps my roommate up at night. (It can actually be turned off, but where’s the fun in that?) The weight of the iMac nestled on top holds the upper and lower halves together. Instillation is easy enough for a non-computery person, like myself, to figure everything out. It adds some height, not like it matters with the fully adjustable screen, but I suppose it ought to be mentioned. 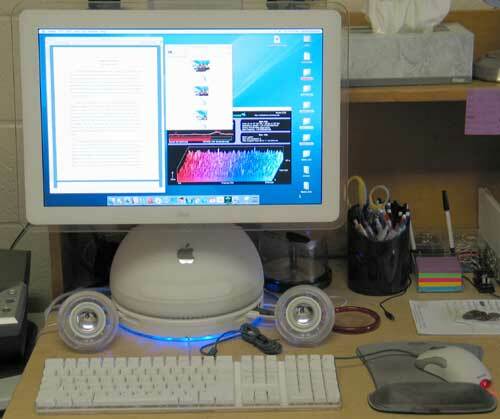 It really serves as the finishing touch for a chic and powerful iMac… for those of us who just do E-mail and the Web, as well as those of us who know what a gigaflop is. Lykara Charters, a member of Washington Apple Pi since she was six, is currently in the first year of a four-year sentence at an enormous state university and is accepting donations. In addition to her formal studies, she plays marching baritone in the university marching band. She likes to sleep in her spare time, but of course has no spare time.